Make the transition to a healthy plant-based lifestyle easier and learn how to change your whole approach to life one step at a time over the course of this 8 week program. Zuzana Fajkusova and Nikki Lefler, two professional personal trainers and lifestyle coaches, show you how to nourish your body and mind through recipes and exercises that radically change your mindset for incredible transformation. 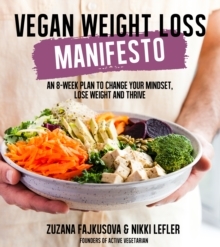 Part manifesto, part diet and exercise plan, Vegan Weight Loss Manifesto helps readers thrive through the transition to the plant-based lifestyle and keep the weight off long-term by fueling your mind and body, without just eating pasta or going too extreme. You can achieve balance through changing your mindset and with the inclusive menu of protein, carbs and fat, you'll use food as medicine to heal yourself and evolve your relationship with food. Readers experience what Zuzana and Nikki do with their clients -follow weekly challenges where you can learn a lesson about the diet, in the exercise program and in the mental and spiritual implications. Feel your best, find your happiness and make your life over with these 100 recipes and exercises.